How can you support students to evaluate the quality of evidence? *Extension Discussion - Analyze an argumentation task within a lesson! *Extension - Try it with your students! 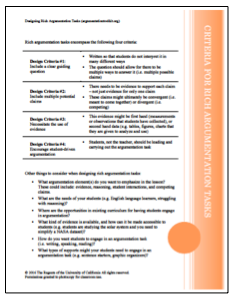 Were any of the design criteria strong in the argumentation task you analyzed? Why do you think so? Were any of the design criteria weak in the argumentation task you analyzed? Why do you think so? Watch the video below, which provides an introduction to the evidence gradient tool. What challenges have you experienced supporting your students in evaluating the quality of evidence? What different ways could you imagine using the evidence gradient tool to help students assess the quality of evidence? What are sources you would trust to provide high quality evidence? Why would you trust these sources? What are sources you would not trust to provide high quality evidence? Why would you not trust these sources? What did you talk about when you were discussing the source of the possible evidence? Were any cards difficult to rank? Why? How can you envision your students engaging in this activity? What would work well? What challenges would they have? 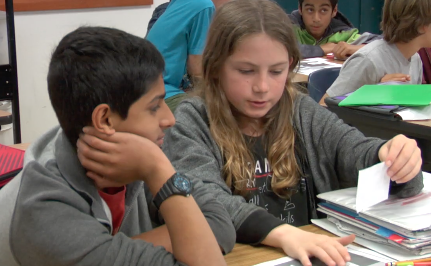 Are there other strategies that you use to support student discussions around evidence? What are benefits of having your students discuss evidence? In the activity you just completed, which design criteria do you think the argumentation task aligned with well? Which design criteria do you think the argumentation task did not align with? How could you redesign the argumentation task to better align? Develop or revise an argumentation task within a lesson to encourage students to evaluate the quality of evidence. This task could include using the evidence gradient tool or it could be another type of activity. Remember to consider the key design criteria when completing this task. For the next meeting, bring the argumentation task you developed, as well as potentially student artifacts (such as a video clip) of students engaged in this.